Description: Phlox in bloom are a sight to behold, with masses of small, star-shaped, colorful flowers blanketing the plants. 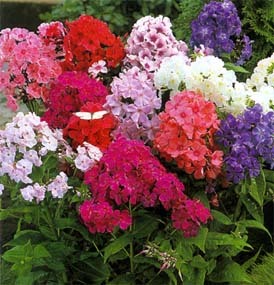 There are several types, the most common of which are spring-blooming creeping phlox and summer-blooming tall phlox. Tips (for care): Apply a thin layer of compost each spring, followed by a 2-inch layer of mulch to retain moisture and control weeds. Water plants during the summer if rainfall is less than 1 inch per week. As flowers fade, cut back old flower stems to encourage rebloom. Divide tall garden phlox every 2 to 3 years to promote vigor and minimize disease problems. After the first killing frost, cut stems on tall phlox back to an inch or two above soil line.